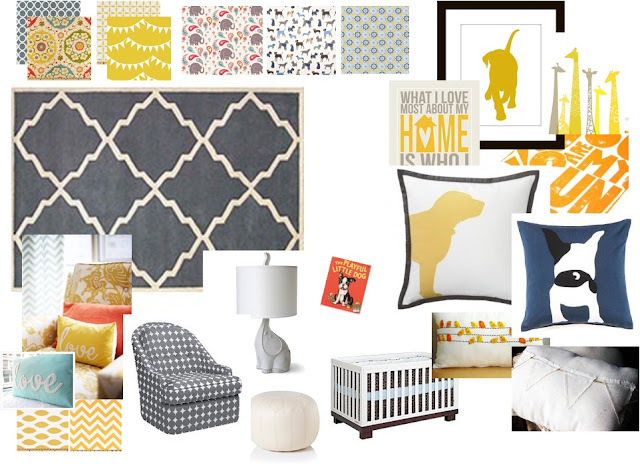 If you follow me on pinterest, you may have taken a peek at my previous ETA-TBD board. Well, now that board is ETA - MAY 2012 (woot!). I started that board when I first joined pinterest in the Spring, as place to save a lot of the things I had bookmarked the previous Fall. And of course, it slowly grew as I saw things I liked popped up throughout the summer. When I found out I was pregnant again, earlier this Fall, I decided to make a mood board to actually place a lot of those items together in a more designer like fashion, since the board wasn't necessarily color focused, but more a hodge podge of ideas. Since I was refusing to look at new baby things, I thought playing around with things I already had pinned would be "safe", since I wasn't technically getting ahead of myself out in search of new things. This was the first board I threw together. It's mainly a lot of fabric swatches, prints, and other things I've been inspired by, like the Serena & Lily Buddy Pillow I mentioned here. I think the Husband is doing a good job appeasing my "vision", since I can tell he's a little hesitant to paint a baby's room so dark. I tried to show him some examples online and I used words like Modern, Whimsical, and Unique. I promised this would not be any "cookie-cutter chair rail with pastels and copyrighted cartoons" type of nursery (no offense to those with that type of room! ), I'm just trying to think outside of the box and go for the unexpected! You can plan on seeing some sunny/mustardy yellow, graphic designs, puppies, DIYs, crisp white and modern furniture, and (naturally) pennants. You know I love a good baby related pennant! I don't know how I missed your announcement but I love the inspiration board and LOVE your news!!! I think the room will look great with pops of yellow or bright blue. I love pink, but there is no way I'd want a pastel room. It would just be too precious for me (and definitely for my husband). Happy painting! i don't think it screams "boy" at all! or "girl, for that matter. i think it's perfectly neutral. love the chevron fabric in the bottom left corner. i just made a pillow out of that (in a blue/grey) for my living room. Leslie - Thanks! I had a baby blue nursery and a blue room growing up... I wonder if I've been subliminly messaged to be a tomboy?? Heather - I dont think it is either, just not sure what others would think when they see the dark slate, grey/blue. I'm def adding in yellow, white, navy, and then maybe blues for boy or periwinkle and corals for girl. We'll see how it evolves. Those two fabrics at the bottom are curtain ideas... either the chevon or bubble like ikat (not sure of the actually print name)... I also love the multi color in the upper left for curtains, lots of bright colors to spice it up! Love the grey as a base. You can add more traditional colors, patterns and prints as accents. I can't wait to see the finished room! Hopefully he's seen your Pinterest. It's such a great way to have everything in one place. The Mr. should be able to get a vibe from seeing that. I like your vision. I'm not a girly girl either, although I'm pegged as such irl since I like sequins and bows. I did peach for Mini's decor and gender neutral other items. I couldn't dig the pink. Amanda - thanks! I think it'll be the perfect base to let yellows, blues, whites, and maybe red or coral pop! Gigi - He's def seen my pinterest, haha... I think he sees the vision, but was definitely alarmed at the paint sample. Now that we have a swatch on the wall, I think he's getting it. Peach is a great alternative to pink! Natasha - the chair is a glider, it's dwell studio and on Amazon. However, it's a total pipe dream since it's like $1200. I'm having a hard time rationalizing spending about 1/2 of that, which we will probably will have to for a quality chair that actually rocks... still hunting though! We did our nursery in grey and LOVE it. Really regardless of the gender of your babe, it's a great color that is definitely less nursery-kiddy and more stylish. Love the inspirations!! love! We have that crib and it's one of my fave things in the nursery.